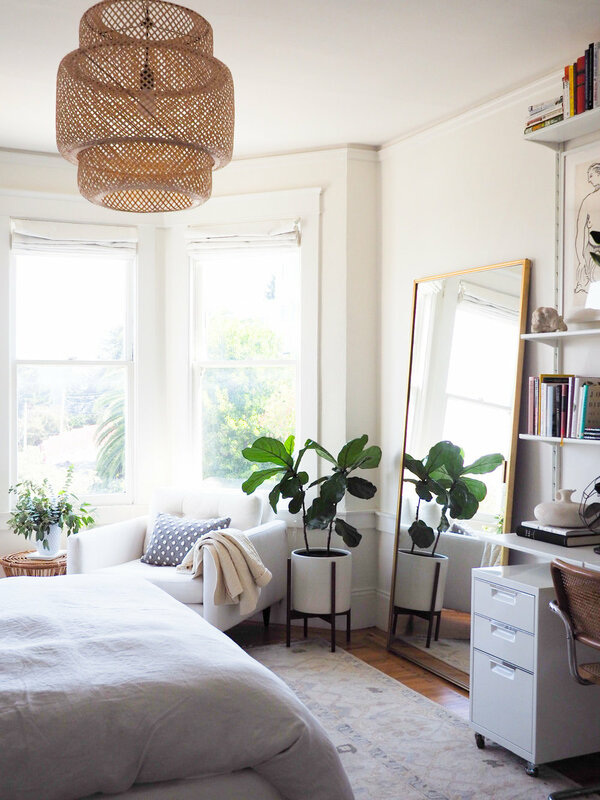 This is the room (and the view of San Francisco out the windows) that made me fall in love with my apartment. Designing it has always seemed like what I imagine dressing a supermodel is like -- you could put her in a brown paper bag, and it probably wouldn't look that bad. But this room has gone through several iterations before I landed on the current version that feels right. Realistically I will continue tinkering with it forever, but I really do love how it is today. Slipcovered Parsons bed: via Restoration Hardware warehouse sale. Pink and navy abstract art, original: similar. Linen duvet in fog: Parachute. White sheets: Brooklinen. Cream lumbar pillow, handmade: similar. Rattan pendant: Ikea. It's a long-running joke among my friends and family that I paint everything white, and they're not wrong. I love white because it makes small spaces feel bigger, and it looks great in bright, well-lit rooms. This room was beige when I moved in, went grey for a few years, and this summer finally switched to white. 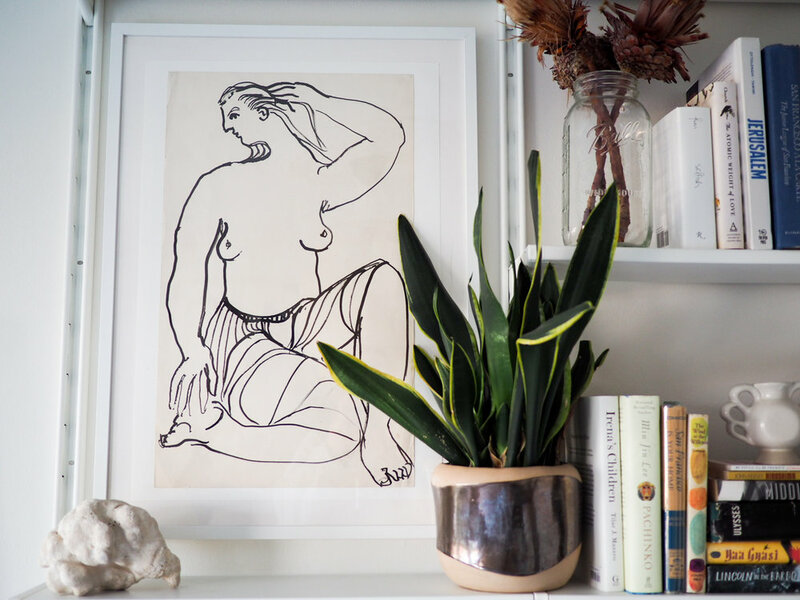 I previously wrote how I wanted to make the room feel simpler and calm, and white walls helped achieve this. Also, I have a near-obsession with large-scale colorful art, and I think white walls make the art pop. Lane Rhythm Series Nightstands via eBay, vintage: similar. White tray: CB2. Alarm clock: Newgate. Mid-century ceramic lamps, old West Elm: similar. I bought this painting from someone on Instagram who originally got it from an artist's estate sale in San Francisco. The painting is HUGE. At five feet by six feet, it did not fit in a car, so I had to crab-walk it down the street home. I loved the painting the minute I saw it, and it remains my favorite thing in the room. It took me a long time to find the right nightstands. I hate the ones with the cubby holes in them for books that end up being a hole you have to dust, and I like having a substantial drawer for storing books. Turns out there are a lot of nightstands with cubby holes and no drawer out there. Eventually, I found this vintage pair for a steal on eBay, and the seller shipped them to me via Greyhound bus (this is apparently a common way to ship furniture, who knew). They arrived wrapped in old cardboard and taped up with duct tape, but perfect once I extracted them. The embroidered cream wool fabric, above, came from a trip to India a few years ago. I wasn't totally sure what I'd do with the fabric when I bought it, but eventually, a wonderful friend sewed it into a long bed pillow for me. It's such a special reminder of my trip and that friend's generosity. Now I want to buy fabric wherever I travel -- it's the best souvenir since it packs small in a suitcase! White armchair, old Crate and Barrel via Craigslist: similar. Case Study Planter: Room and Board. Rattan side table, thrifted: similar. Floor mirror, vintage via Craigslist: similar. Grey wool polka dot pillow: Anthropologie. Grey oriental rug via eBay: similar. White Roman shades, old from Hot Blinds: similar. The massive floor mirror was a Craigslist find from a wacky old man who drove it to my apartment in his VW van, complete with little curtains on the windows. The mirror is actually a sliding closet door from the 60's or 70's, when people had much more glamorous closet doors. I have since seen a bunch of them on Craigslist, so mine doesn't seem that unique. The mirror is currently leaning against the wall with felt pads stuck to the corners so it won't scratch anything. This is definitely not earthquake-proof, so if you have ideas for a more secure attachment, let me know in the comments! Figure drawing, vintage: similar. White frame: Ikea. Marcel Bruer-style desk chair, via Craigslist: similar. White file cabinets, via Craigslist: CB2. Wall shelving: Ikea. Brass wall clock: Target. Gold picture frame: Ikea. Leather mousepad: Etsy. Walnut mid-century lamp base, vintage via eBay: similar. Cream woven lamp shade: Target. I wrote all about my process for hanging the shelves here. My favorite aspect is that I can easily re-configure them. I recently picked up a computer monitor on Craigslist which required me to move things around to accommodate it. It couldn't have been simpler to change the shelf design. White dresser: Ikea, via Craigslist. Small jute rug: Ikea. White tissue box cover: Amazon. I am truly blessed that the room has two closets, one on either side of the bedroom door. I use one as a linen closet slash storage for whatever art/house project I'm cooking up at the moment. I took the door off the other closet where I keep my clothes, and it made the room feel instantly bigger without an always-open door in the way. While the closet isn't lacking in space, I installed wall shelves way up high for storing holiday decorations and extra bedding. The Ikea dresser fit perfectly under hanging clothes, and added wall hooks made for perfect purse storage. What can I say, I love these guys. I got them from the Alemeny Flea Market (Alameda's much less fancy relative in Bernal Heights). Sadly, they're slowly crumbling because they were made of clay and never fired, I think? So you can't touch them or they'll break apart. Not very convenient, especially for dusting, but they're very pretty. And this is my favorite spot in the room -- a perfect place to sit with coffee and watch the San Francisco shenanigans outside the windows. All photos by Eliza Kern. This post contains affiliate links, so I may receive a commission if you like some of my recommendations above.